After roughly three years of construction, Apple is set to open the doors to its massive new campus in Cupertino, California, in just over a month. 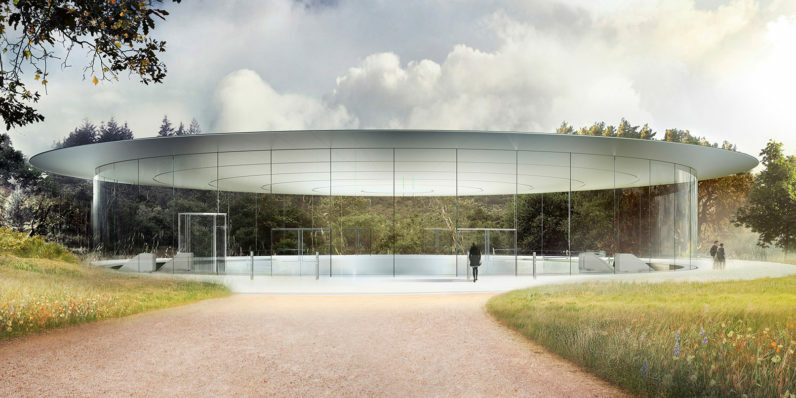 Apple Park will seat more than 12,000 employees across a number of connected buildings, including the spaceship-like main building that spans a massive 2.8 million square-feet. But its most thoughtful feature is a lot smaller. You’ll need to climb a hill within the campus to find yourself at the Steve Jobs Theater (pictured at top), an 1,000-seat auditorium that will open later this year and is dedicated to the memory of the company’s late co-founder and former CEO. The building, which will likely be finished over the summer, features a 20-foot-tall glass cylinder that’s 165 feet across and is topped with a metallic carbon-fiber roof. There’s also a visitors center to receive the public, complete with an Apple Store and a cafe. The buildings are connected by parkland covered by more than 9,000 native trees; their roofs are adorned with enough solar panels to generate 17 megawatts of power. The facility, designed by architecture firm Foster + Partners, will see Apple move its employees in over a period of six months.